The DCU Ultimate Frisbee team reached the mixed Intervarsity Final losing out to an experienced Trinity side in the showpiece by 10-6. Hailing from American college campus’ and every growing in Ireland, DCU Ultimate treasurer and member of the mixed team Seán Fitzgerald describes Ultimate Frisbee for the uninitiated. “It’s like American football, in that you have to get the disc into the endzone, you have to catch it in the endzone. That’s how it works,” said Fitzgerald. “It’s a game that people can pick up and play well quite easily but, it’s difficult to be very good at it,” he added. Fitzgerald highlighted the tough nature of the tournament referring to the quick turnover between games. “It’s all so compact, you play a lot of games so it’s a hard couple of days,” he admitted. The side finished second in their group after three intensely close matches. “We went universe point (sudden death) against Trinity, universe point against NUIG and then we went to universe point against UCC,” said Mark Cunningham, Secretary of DCU Ultimate. “In all three of our group games there was only one point in it,” said Fitzgerald. “Trinity beat us by one. We were second in our group then which meant we didn’t have top play a team below our seeded team,” he added. DCU felt extra strain in the tournament as they only had the bear minimum requirement of girls on the team putting immense pressure on their endurance. “We have really strong girls. Áine and Alex both made the Ireland U24’s this year,” said Fitzgerald. Cunningham triumphed the DCU sides achievement in the competition citing that compared to other teams they “had no fourth-year men at all”. After a relatively easy win against UCC in the quarters, the DCU players faced a stern challenge against NUIG in the semis. “NUIG was a tough game. They were probably stronger than we were expecting them to be,” said Fitzgerald. With the players we had lost the previous year, people were expecting us to not play very well. Look they definitely weren’t expecting us to make semi-finals,” he added. “We shook the tournament really. Everyone was like who are these lads,” Cunningham proclaimed proudly. “We lost to trinity in the final but, they won it last year. Everyone was expecting them to get as far as they did,” admitted Fitzgerald. On reflection Fitzgerald saw the natural progression of the DCU Ultimate culture and is less surprised than most on their recent consistency of performance. 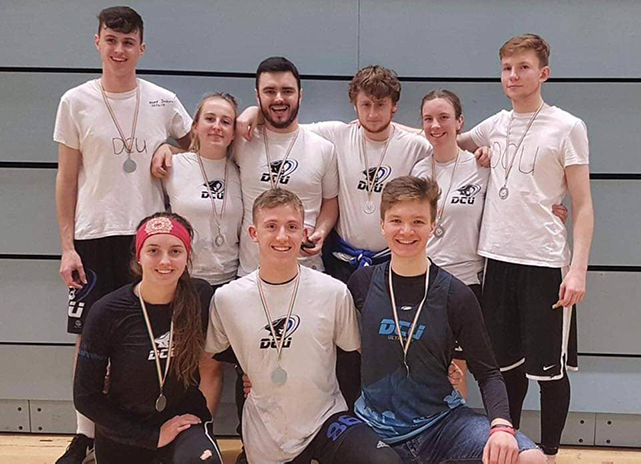 “People wouldn’t have expected much of DCU last year too, but we got to five finals and won our first outdoor intervarsity’s last year so its been a good year,” he said. DCU Ultimate now host the men’s indoors competition and both the Secretary and Treasurer are hopeful of their side’s chances. “Cork won it last year and they’re very strong again. UL and Trinity would be quite strong, but we’ll fancy our chances against whoever is in our groups,” said Fitzgerald. “We would be disappointed if we didn’t make the semis,” added Cunningham. “There’ll probably be about twenty teams. There’re new colleges starting to field teams now like WIT and Letterkenny as well,” said Fitzgerald. “We’ll be hoping to get three teams because it is in DCU,” he added. The two concluded with praise for the DCU ultimate coach and Female Club POTY Fiona Mernagh on her part in creating a “winning tradition” in DCU Ultimate that was absent in the club before she stepped in as coach.